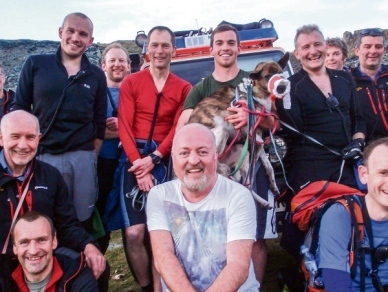 Star-struck mountain rescuers came to the aid of comedian Bill Bailey after his dog got stuck on a Lake District fell. The crew did not know who the pet’s owner was after being called to Haystacks – and were then stunned to find out it was the comedian and TV personality. Bailey’s dog had become stuck on a steep part of the mountain and he had headed down to a nearby farm to ask for help. Mike Park, team leader at Cockermouth Mountain Rescue Team, knows the farmer, who passed on his number to Bailey. “I got this telephone call out of the blue, I hadn’t a clue who it was,” Mr Park told the News & Star. The team were called out at about 6pm to help get the dog. Bailey, known for his stand-up comedy, as we as appearances on shows such as Never Mind the Buzzcocks, Have I Got News For You and QI, was staying in Cumbria on holiday. “Just as we were approaching him somebody in the back of the Land Rover said: ‘That’s Bill Bailey’,” added Mr Park. Mr Park stressed the team who have “gone out for whoever it had been”.